CHATTANOOGA, Tenn. – The No. 1 Penn State wrestling team is in a three-way battle for the team title after the opening day of the 2014 Southern Scuffle. Coach Cael Sanderson’s squad, No. 2 Minnesota and No.3 Oklahoma State are all within three points of each other in a tight team race. Heading into day two, each and every one of Penn State’s 17 entrants remains alive. A total of 12 Penn Staters will compete in the quarterfinals tomorrow morning while five others will wrestle in consolation action. Penn State has 53.0 points, just a half point shy of Minnesota’s 53.5. Oklahoma State is close behind at 50.5. Penn State rolled through the first round with a solid 7-2 record plus eight byes, meaning 15 of Penn State’s 17 competitors moved into the second round. 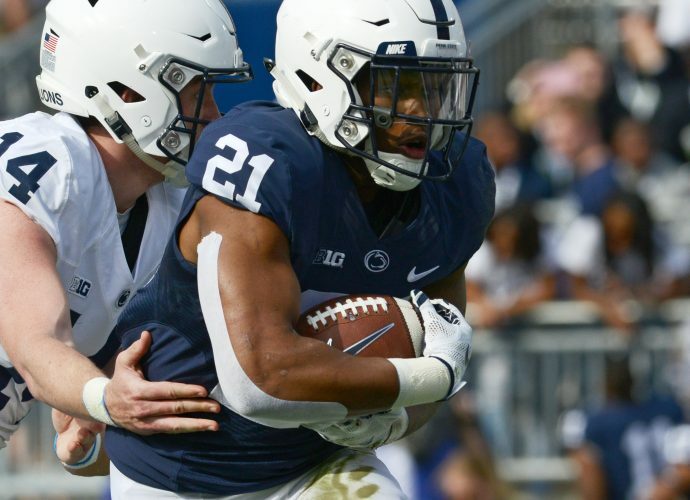 Round two was even more impressive for the Nittany Lions as the squad went 14-1. Penn State went 2-0 in its first consolation round and headed into the evening session with a 23-3 overall mark. The Lions went 12-2 in the third round of the championship bracket, sending 12 wrestlers into this morning’s quarterfinals at nine of the ten weights. The team went 3-0 in the third consolation round and ends day one with a gaudy 38-5 record. The Nittany Lions collected 11 majors, two tech falls, seven pins and one forfeit. Only one wrestler scores at each weight (whichever wrestler has earned the most points at any given time). Red-shirt freshman and Juniata graduate Zack Beitz continues to impress at 149, rolling to a 2-0 mark and heading to the quarterfinals. Beitz downed No. 9 Scott Sakaguchi of Oregon State in the second round, his second win over a ranked wrestler this year. Leading the charge for Penn State’s quarterfinalists was junior All-American Nico Megaludis, who went 3-0 on the day with two majors, including a dominating 12-3 win over Minnesota’s Jordan Kingsley in the third round. At 133, freshman Jimmy Gulibon, ranked No. 17 nationally at 133, went 3-0, including a swift 5-4 win over Virginia’s Joe Martinez in the third round. True freshman Zain Retherford was outstanding at 141, going 2-0 with a major and a pin. He got his fall at the 2:30 mark over North Carolina’s Joey Moon in the third round and improved to 14-0 with the wins. All-American David Taylor continued to roll at 165. Taylor, ranked No. 1, improved to 14-0 on the year with a 2-0 performance including a tech fall and a pin. The pin was the 45th of his career, putting him just eight shy of Penn State’s all-time record. All-American Matt Brown rolled into the quarterfinals with a 3-0 day, including a forfeit win, a pin and a major. Brown improves to 15-0 on the year and is ranked No. 3 nationally at 174. All-American Ed Ruth kept his quest to be a four-time Scuffle champion alive with a dominating 2-0 day. Both wins came by pin, including a first period (2:51) fall over Ohio’s Ryan Garringer in the third round. Ruth is now 14-0 on the year and has won 82 straight matches dating back to his freshman year. True freshman Matt McCutcheon. wrestling unattached, also advanced to the quarterfinals at 184 with a 3-0 day. Sophomore Morgan McIntosh, ranked No. 3 at 197, rolled into the quarterfinals with a 2-0 day, both majors. Junior Jimmy Lawson went 2-0 at 285, including a 4-1 win over Old Dominion’s Matt Tourdot in the third round, and will wrestle in the quarterfinals. Classmate Jon Gingrich also advanced to the quarters, going 3-0 including a 5-0 win over No. 17 Amar Dhesi of Oregon State in the third round.